When I'm looking for a calm, comfort read there are many books I turn to, and this is one of my favorites. Freddy is not your average farm pig. He has been to Florida (Freddy goes to Florida) and to the North Pole (Freddy goes to the North Pole). He loves to read and frequently writes poetry. 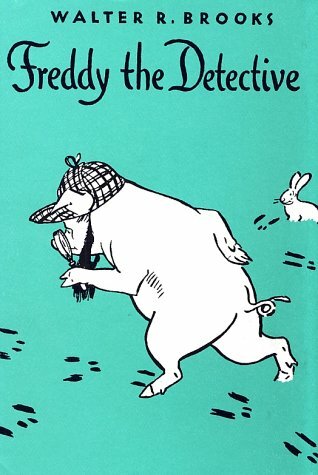 So it is no surprise to the other animals on Mr. Bean's farm when Freddy comes up with a new scheme: He will be a detective like Sherlock Holmes. He finds his first case right away: young Everett's toy train has gone missing. It was in his room when he went to sleep and when he woke up it was gone. It doesn't take Freddy long to figure out where it has gone: Simon the Rat and his relations are back in town. Despite the looming crisis of the rats, Freddy and his friends get up to all sorts of adventures; there's the Case of Prinny's (a dog's) Missing Dinner, and the Disappearance of Egbert, a young rabbit. As criminals are caught, Freddy and his friends realize they must be brought to justice, so they have a meeting in the cow barn to elect a judge and find a place for a jail. Written between 1927 and 1958, the Freddy the Pig series is filled with colorful characters and fun adventures without ever being inappropriate or slang-y. They are occasionally political, but that makes them all the more interesting to read and discuss. Though these books are beloved by many, they have been in and out of print for the last few decades. It was much to my family's delight to discover a few precious hardbacks at our local Half-Price Bookstore a few years ago, and they have since come out on Kindle. Violence: a few tussles, and once or twice someone gets butted by the goat or sat on by the cows. Mature Themes: In various books we have rude houseguests, rats and various other people. There are a few attempted eatings of the animals, but none ever succeed. The fact that animals are food is acknowledged, but not dwelt upon. This looks like a terrific series! I don't know why--maybe it's the "pig" in the title--but this makes me think of my favorite series when I was a kid: the Mrs. Piggle-Wiggle books! There's something special about these old-fashioned stories, isn't there. The "Freddy the Pig" series sounds like something I could read aloud to my five-year-old, and both of us would enjoy it! Great review, Megan!